Juliet Sharman-Burke is a practicing analytic psychotherapist and teacher for Tarot and Astrology, Giovanni Caselli is a professional illustrator. This deck was initially available only as a part of the "Beginner's Guide to Tarot" book and card set published in 2001 by St. Martin's Press. Since 2002 it was also available as a deck only by Connections. 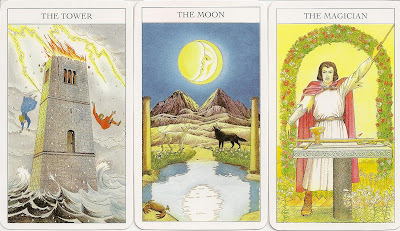 The Major Arcana are unnumbered, so there is no fixed place for Strength or Justice; the LWB rearranges several other major arcana. The suits are Wands, Cups, Swords and Pentacles, with courts of Page, Knight, Queen and King. Each suit has its own colour scheme related to elements and the elemental attributions Pentacles - Earth, Swords - Air, Wands - Fire, Cups - Water. The reversible backs are red with a silver border and tiny copyright attributions at both ends of the card. The Sharman - Caselli deck is basically RWS, but nearly all of Waite's occult imagery is replaced it with easier to understand symbols. e.g. 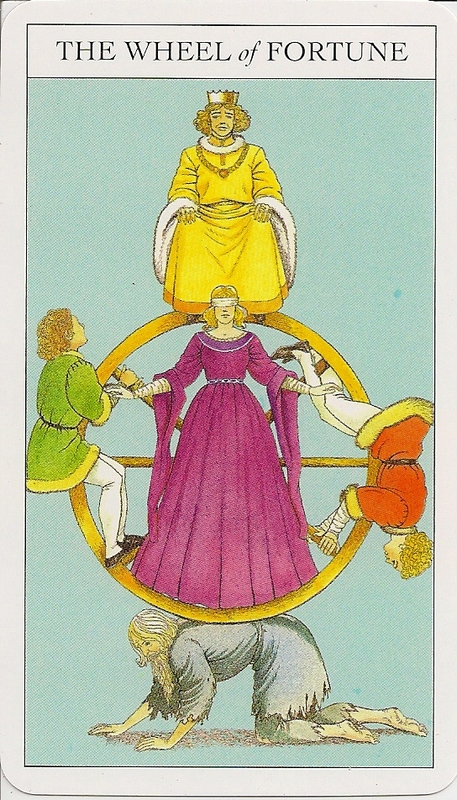 Waite's Alchemical Wheel of fortune with it's sphynxes, serpents and Hermanubises is replaced by the more traditional Fortuna and her Wheel. 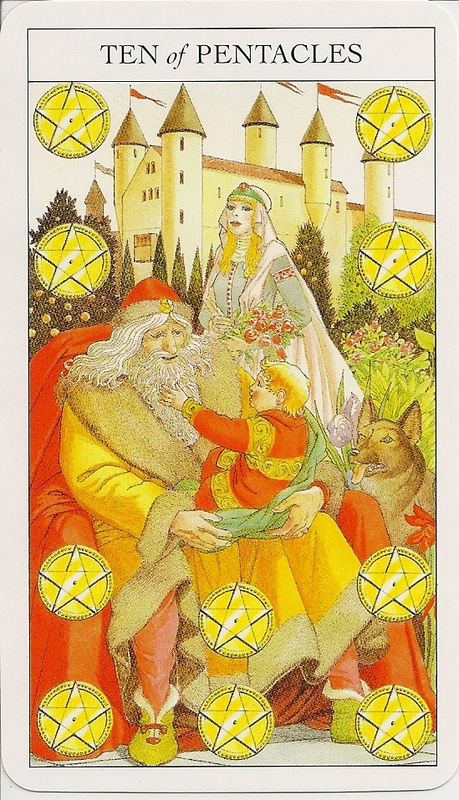 The Ten of Pentacles looks like Father Christmas with his red cap, throne-type seat, and a child on his knee.